We initiated a 3-year study at the Aurora Research Farm in 2015 to compare the corn, soybean, and wheat/red clover rotation under conventional and organic cropping systems during the 3-year transition period (2015-2017) to an organic cropping system. We used three entry points or previous crops from 2014 to initiate the 2015-2017 study: 1) grain corn, 2) small grain, and 3) soybean. Three of the many objectives of the study are 1) to determine the best previous crop (2014) for the transition, 2) the best crop to plant in the first year (2015) during the transition and 3) do corn, soybean, and wheat respond similarly to management inputs (high and recommended) under conventional and organic cropping systems? This article will discuss soybean yield and seed weight under conventional and organic cropping systems under high and recommended management inputs. We used a White Air Seeder to plant a treated (insecticide/fungicide seed treatment) GMO variety, P22T41R2 with the RR2Y and SCN traits, in the conventional cropping system under recommended inputs at 150,000 seeds/acre in 15 inch row spacing. We also planted a non-treated, non-GMO variety, 92Y21, in the organic cropping system under recommended inputs at 150,000 seeds/acre but in 30-inch row spacing. We used the typical 15” row spacing in the conventional cropping system, but the typical 30” row spacing (for cultivation of weeds) in the organic cropping system. In addition, P22T41R2 is not an isoline of P92Y21 so only the maturity of the two varieties and not the genetics are similar between the two cropping systems. We also planted both varieties in their respective cropping systems at 200,000 seeds/acre in the high input management treatment, and also included the organic seed treatment, Sabrex, in the seed hopper when planting 92Y21 in the organic cropping system in the high input treatment. We applied Roundup (PowerMax) at 32 oz/acre for weed control in conventional soybean at the V3-4 stage (June 27) under both recommended and high input treatments. We used a tine weeder to control weeds in the row in organic soybean under both management inputs at the V1 stage (June 5), when corn was the previous crop, but not in the other two experiments because of limited weed pressure. We then cultivated close to the soybean row in both recommended and high input organic treatments at the V2 stage (June 20); with subsequent cultivations between the rows at the V3 stage (June 25), beginning flowering (R1) stage (July 6), and full flowering (R2) stage (July 16). The high input soybean treatment in the conventional cropping system also received the fungicide, Priaxor at 4 fl. oz./acre at the beginning pod (R3) stage (July 31) for potential disease problems and overall plant health. Because of exceedingly dry summer conditions at the Aurora Research Farm, (2.8 inches of precipitation in July, 1.36 in August, and 1.94 inches from September 1 until September 23, the day of harvest), both varieties attained the R7 stage, physiological maturity, from September 10-12, earlier than normal for the May 23 planting date of this study. Soybean seed yield showed a previous crop x cropping system interaction (Fig.1). 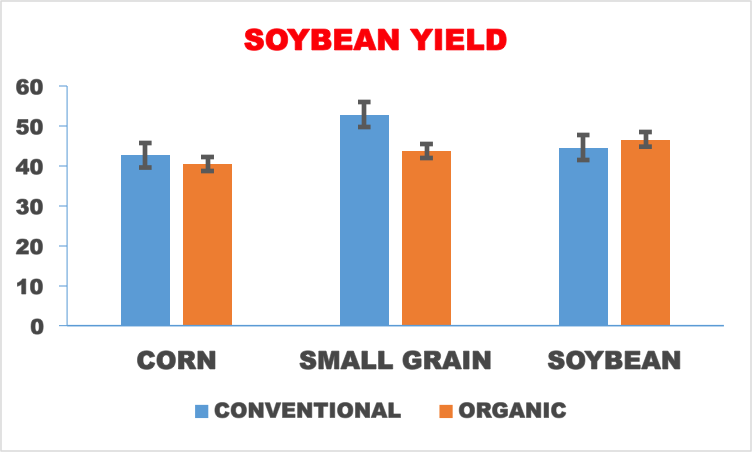 Soybean seed yield was essentially the same following the 2014 corn (42.7 bu/acre) or 2014 soybean (44.5 bu/acre) crops under conventional cropping compared with the organic cropping system (40.4 and 46.6 bu/acre, respectively, Fig.1)). 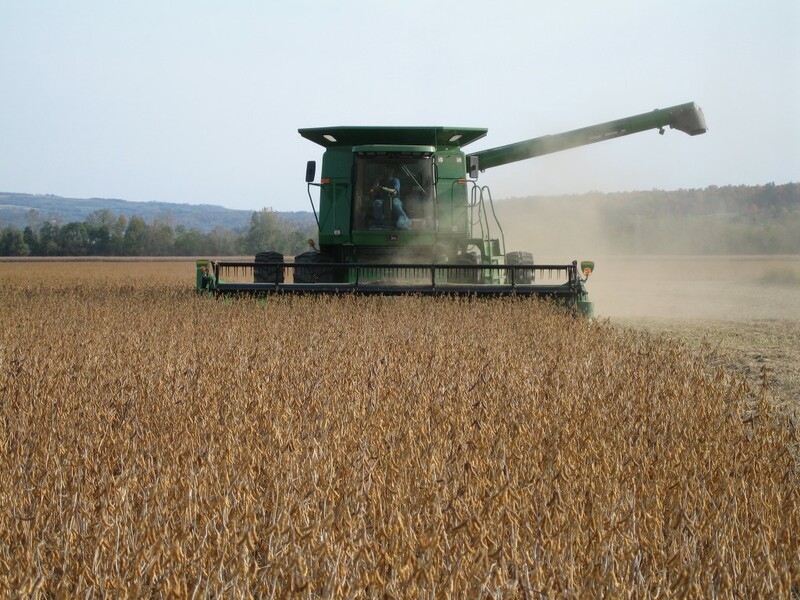 Soybean seed yield, however, was greater under the conventional cropping system (52.8 bu/acre) compared with the organic cropping system (43.7 bu/acre) following the 2014 small grain crop. Early plant populations between the conventional (~155,000 plants/acre) and organic cropping systems (~158,000 plants/acre) were similar and weed control in the organic cropping system (0.2 to 0.3 weeds/m2) was almost as good as in the conventional cropping system (0.12 weeds/m2) following the 2014 small grain crop (http://blogs.cornell.edu/whatscroppingup/2015/09/16/emergence-early-v2-stage-plant-populations-and-weed-densities-r4-in-soybeans-under-conventional-and-organic-cropping-systems/). Consequently, it is not clear why soybean yielded greater in the conventional compared with the organic cropping system when following a small grain crop. Fig.1 Soybean yields in 2015 following different previous crops (corn, small grain, or soybean in 2014) under conventional and organic cropping systems. Soybean seed yield also showed a cropping system x management input interaction (Fig.2). When averaged across all three previous crops, seed yield in the conventional cropping system was greater in the high management treatment (48.6 bu/acre) vs. recommended management treatment (44.7 bu/acre) but similar between management treatments in the organic cropping system (44.3 and 42.9 bu/acre, respectively, Fig.2). Early plant stands in the conventional cropping system under recommended inputs averaged about ~122,000 plants/acre, which in numerous studies in NY have been adequate for maximum yield. Consequently, the increased yield in the conventional cropping system under high management inputs may have been associated with the fungicide application at the R3 stage. Fig. 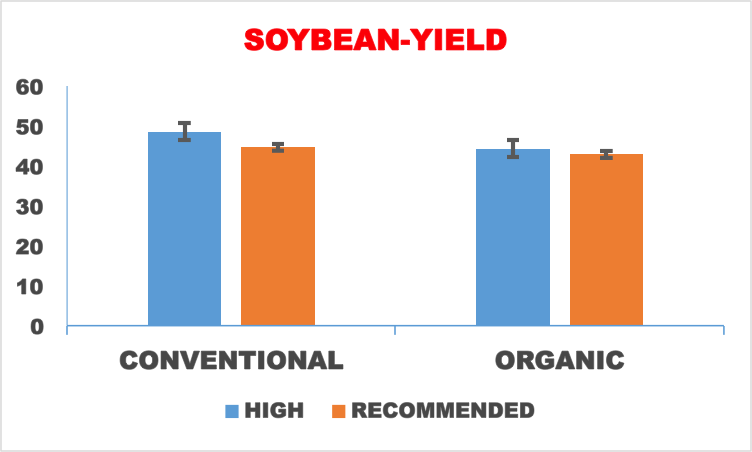 2 Soybean yields under conventional and organic cropping systems in the high and recommended management treatments. Exceedingly dry conditions, however, ensued after the fungicide application, which probably contributed to the lack of visible disease symptoms from the R3-R8 stage, leading to speculation about fungicide plant health effects. This speculation is further reinforced by the increased seed weight in the conventional cropping system in the high management treatment (156.0 mg) compared with the recommended management itreatment (150.9 mg), but not in the organic cropping system (174.4 and 176.7 mg, respectively, Fig.3). Nevertheless, the return on the 4 bu/acre yield advantage would not offset the input costs associated with 50,000 more seeds/acre, the fungicide, and the fungicide application, resulting in both the high and recommended management treatments similar in partial returns. (The greater seed weight in the organic vs. the conventional cropping system is probably associated with different genetics of the two varieties and not the cropping system). Fig. 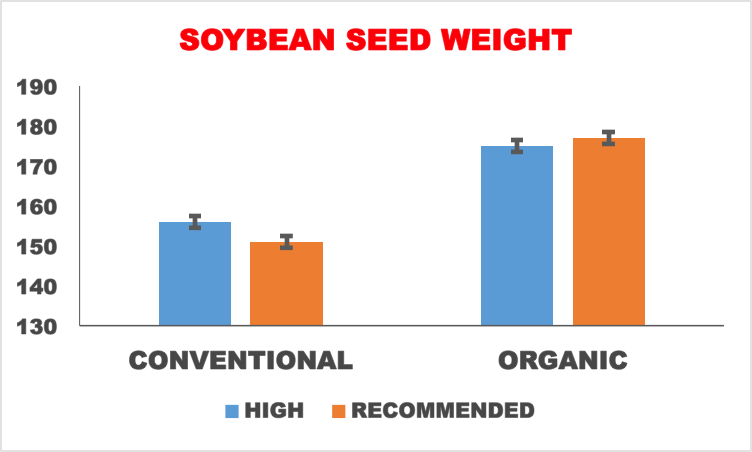 3 Soybean seed weights under conventional and organic cropping systems in the high and recommended management treatments. In conclusion, soybeans, which do not require fertilizer N, was the superior first-year transition crop compared to corn in this study. Soybean plant populations were similar or higher in the organic compared with the conventional cropping system. Although more weeds were observed in the organic compared with the conventional cropping system, weed densities averaged less than 0.9 weeds/m2 in all organic treatments, which probably did not influence yield greatly. Soybean yields were essentially the same under conventional and organic cropping system when following the 2014 corn or soybean crop (but were ~17% lower when following a 2014 small grain crop). Overall, soybean looks to be an excellent first year transition crop from conventional to organic cropping systems because soybean does not require fertilizer N, and is a row crop that is competitive with weeds, especially when comparing it with corn.